October 4, 2003 22:49<October 21, 2004 22:59lable. More information will be added to this page as it comes to hand. 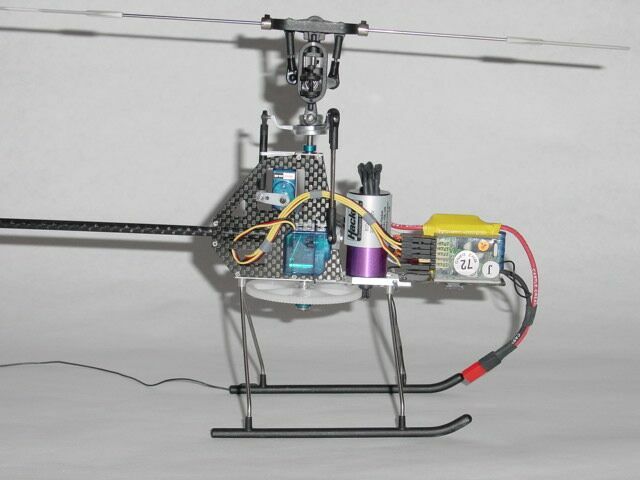 One of the first manufacturers to produce a commercial Micro Heli. The Ikarus MicroHeli product line consists of the Piccolo range. - Ikarus's entry-level Micro-Heli. This is a fixed pitch machine and is basically a cheaper version of the ECO Piccolo. The main difference with the FUN is the use of plastic bushings rather than ball bearings, and the substitution of some carbon-fibre parts with metal replacements. The FUN is fully upgradeable to ECO specification, and can also be fitted with the Ikarus Collective PItch upgrade. It is worth noting here that it is MUCH cheaper to purchase a FUN and upgrade it to ECO specs, than it is to purchase an ECO in the first place. - The original Piccolo. Another fixed-pitch machine, the ECO Piccolo has received a number of updates over the years. The ECO can be upgraded to collective pitch using the Ikarus Collective Pitch upgrade kit. It can also be upgraded to very close to PRO Piccolo specification by substituting PRO parts for ECO ones. - Ikarus's "Hot" Collective Pitch machine. Slightly larger in length and rotor diameter, and a little heavier than the FUN and ECO, the PRO PIccolo is a fully-aerobatic micro heli straight out of the box. Not recommended for beginners. Ikarus also produce upgrades for their machines, including an ECO conversion kit, to bring the FUN up to full ECO specification, and a Collective Pitch upgrade which can be used on both the FUN and ECO Piccolos to turn them into collective pitch machines. Other upgrades include nightflight sets, duration flying kits, and tuning parts. Ikarus produces a number of semi-scale bodies for the PIccolo, including the Bell UH-1B (Huey), the Bell 222/Airwolf (with optional retracting undercarriage) and Hughes 300. Another early entry into the commercial MicroHeli market, MS-Composit produces the Hornet family of Micro-Helis. - MS's entry level machine, but wait for it - the NT stands for No Tail! Yes, this is a fixed-pitch Micro-Heli with a big plastic fin where the tail rotor should be. I assume the machine is intended to be hand-launched like a model plane, and kept in constant forward flight. The lack of a tail rotor would prohibit being able to hover and severely limit the learning to be gained from this machine. There is an upgrade kit to add a proper tail rotor assembly, but personally I'd advise to skip this one and go straight to the 'full' Hornet. - This is the original Hornet. A fixed-pitch machine which has received constant refinement and improvement over the years, making for a mature well balanced little heli. 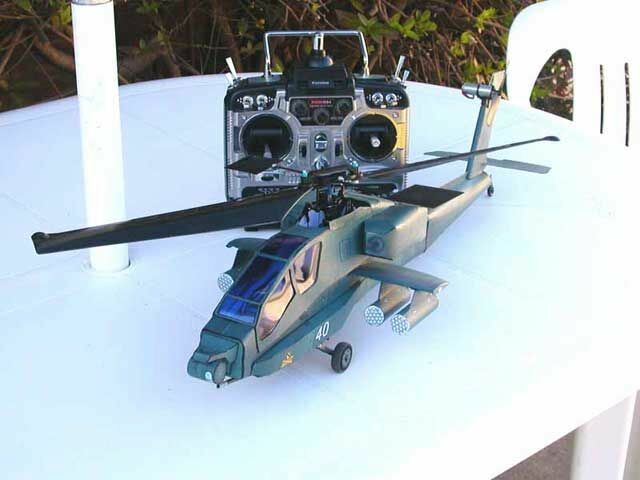 The Hornet is unique in the Micro Heli world, having a shaft driven tail rotor just like its full-size counterparts. The MS Hornet can be upgraded to collective pitch with the MS Collective Pitch Upgrade kit. MS also supply the Hornet as a complete semi-scale Schweizer 300 kit, which makes them the only manufacturer so far to sell a complete-in-box semi-scale microheli. - MS's "Hot" collective pitch machine. Fully aerobatic out of the box, the MS Hornet CP is basically the std MS Hornet with the CP upgrade Kit. An excellent flier, but it may prove to be a bit of a handful for a beginner if expert assistance is not available. The Hornet CP will most likely be dis-continued as the the upgraded Hornet CP-X takes its position in the market. - The latest redition of the popular Hornet CP. The CP-X is a mild upgrade of the original Hornet CP kit. The CP-X kit is basically the old CP Hornet, but features a boom support set (similar to the Hornet II), carbon fibre main blades, and a pre-assembled steel tail rotor shaft with the tail hub pre-mounted. Like the Hornet CP, the CP-X is fully aerobatic out of the box. Another excellent flier, but it may prove to be a bit of a handful for a beginner if expert assistance is not available. 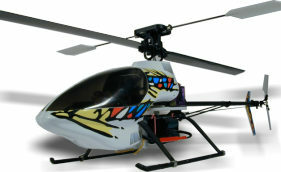 - The Hornet II is MS Composit's brand new offering to the micro-heli market. A slightly larger machine than the Hornet CP /CP-X, the Hornet II still qualifies well with the Micro Heli classification with a 560mm Rotor Diameter. MS have taken all their experience with teh provious Hornet machines, improved and fixed all the annoyances, and come up with a new design which makes for a truely great microheli. Docile, but responsive and capable of wild 3-D aerobatics, the Hornet II is a heli for all skill levels from average to expert. As it is also a very stable and controllable aircraft the Hornet II can also make an excellent beginners heli, provided that expert assistance is available for both construction and flight training. Our full review of the Hornet II can be found on the MS-700 Hornet II review page. MS also produce upgrades for their machines. There is the MS Tail upgrade which adds a tail rotor to the Hornet NT, and the Hornet CP upgrade that adds collective pitch to the standard fixed-pitch Hornet. MS also market a brushless motor/esc combo, and a number of improved parts for older model Hornets. MS produce a Schweizer 300 body kit, and the futuristic Dynamic fuselage which bears a passing resemblance to the AH-66 Comanche. MIA originally produced the Robin micro, but it appears from their website that the Robin is no more, and MIA are concentrating on sub-micros. A 13" (330mm) Rotor sub-micro weighing around 4 to 5 ounces (113-142g). As I have never seen one of these, or met anyone that owns one, I am unable to comment further on this machine. A 15" (330mm) Rotor sub-micro weighing around 4 to 5 ounces (113-142g). As I have never seen one of these, or met anyone that owns one, I am unable to comment further on this machine. 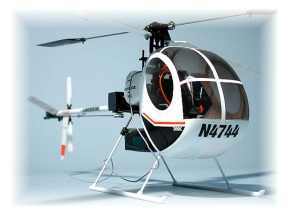 Century are a relative newcomer to the Micro-Heli scene, and their initial offering is the Century Hummingbird. The Hummingbird is a fixed pitch machine of similar size to the Piccolo and Hornet. The Hummingbird kit comes mostly pre-assembled with very little 'building' required to get it into the air. From what I have seen so far, It appears to be a well designed, robust machine that flys well. 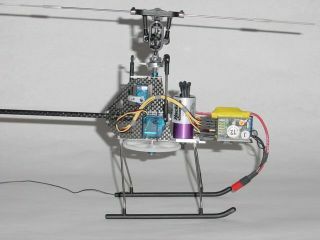 GWS has now entered the Micro Heli market with their Dragonfly FIxed Pitch MicroHeli. The Dragonfly is a fixed pitch machine of similar size to the Piccolo and Hornet. Its vital statistics area rotor diameter of 510mm, a length of 503mm and weighs 280g. The Dragonfly comes in three configuations, the basic kit - which includes motors gyro and mixer, an ARTF kit - which also includes all radio equipment, batteries and charger, and a 'fly out of the box" model which has all of the above and is already assembled and set up ready to fly.